Alfred Stieglitz (1864–1946), Edward Steichen (1879–1973), and Paul Strand (1890–1976) are among the most famous photographers of the 20th century. This handsome volume showcases for the first time the Metropolitan Museum’s extraordinarily rich holdings of works by these diverse and groundbreaking masters. 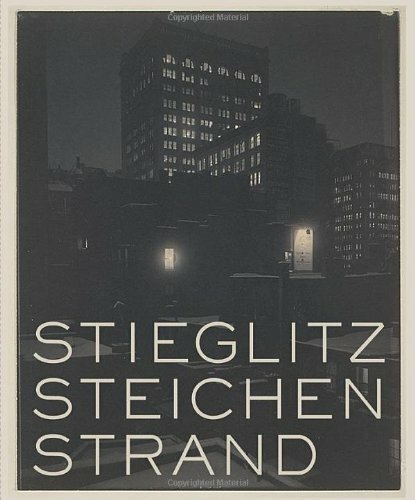 A passionate advocate for photography and modern art promoted through his “Little Galleries of the Photo-Secession” (also known as “291”) and his journal Camera Work, Stieglitz was also a photographer of supreme accomplishment. Featured works by Stieglitz include portraits, landscapes, city views, and cloud studies, along with photographs from his composite portrait of Georgia O’Keeffe (selected by O’Keeffe herself for the Museum). Steichen—perhaps best known as a fashion photographer, celebrity portraitist, and MoMA curator—was Stieglitz’s man in Paris, gallery collaborator, and most talented exemplar of Photo-Secessionist photography. His three large variant prints of The Flatiron and his moonlit photographs of Rodin’s Balzac are highlighted here. Marking a pivotal moment in the course of photography, the final double issue of Camera Work (1915–17) was devoted to the young Paul Strand, whose photographs from 1915 and 1916 treated three principal themes—movement in the city, abstractions, and street portraits—and pioneered a shift from the soft-focus Pictorialist aesthetic to the straight approach and graphic power of an emerging modernism. Represented are Strand’s rare large platinum prints—most of them unique exhibition prints of images popularly known only as Camera Work photogravures.